Relentless Financial Improvement: No more Vanilla Reload purchases with credit card at CVS? No more Vanilla Reload purchases with credit card at CVS? Looks like the credit card fun may be over at CVS. There is currently a lot of buzz about CVS stores no longer allowing for purchases of several types of reloadable cards (including Vanilla Reloads and Paypal Reloads) made with credit card starting on Monday, March 31st, 2014. You can read more details and speculation on Flyertalk here and Dan’s Deals here. I will make a personal trip to CVS tomorrow (3.31.2014) to see if this is true. If it is indeed true, tomorrow will be a sad day. 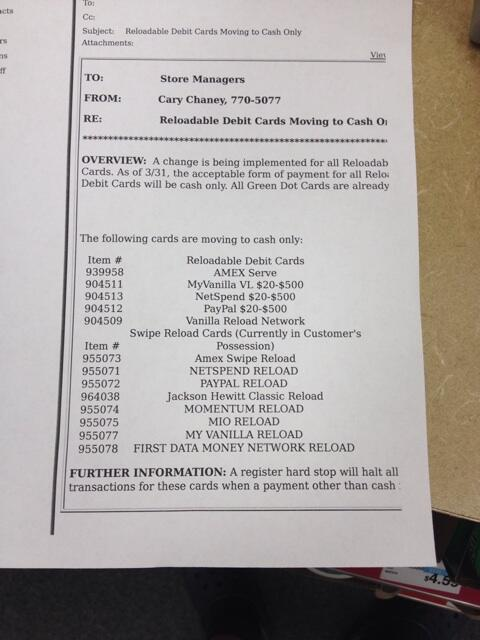 3/31/14, 1:15pm update: No problems purchasing Vanilla Reload cards with my Barclaycard Arrival MasterCard today. There are mixed reports on flyertalk: many individuals can still make purchases with their credit card, while some cannot. 3/31/14, 2:45pm update: My wife tried to buy some more Vanilla Reloads from a CVS location we regularly frequent, and the register blocked her credit card. Vanilla Reloads (and other prepaid cards) are now cash only. This is definitely a game changer. 3/31/14, 8:14pm update: After dinner, I decided to swing by another local CVS to try to buy some Vanilla Reload cards. This time, I was able to buy a few without issue. I’ve read mixed reports on Flyertalk indicating that some CVS stores are now hard coded for cash only purchases of Vanilla Reload cards. Others have mentioned that the systems will complete their update on April 4th, 2014. In the meanwhile, get them while you can! 4/1/14, 6:00pm update: Many Flyertalk members are still reporting being able to successfully purchase Vanilla Reload cards with a credit card. I visited 2 different CVS locations in my area tonight and it looks like the racks are cleaned out of all the Vanilla Reload cards!